If your into wet shaving or honing razors I’m sure you’ve come across Frank Misa. Besides his contributions to other forums Frank runs his own Facebook group called Culinary Institute of Shaving. I first met Frank in person a few years back as part of a honing group which gathered in Belmont Lake State Park, Babylon on an overcast summer's day. Also in that group was Billy T, Peter Charkalis and 10 other wet shaver’s eager to learn this new craft. The day flew by as we learned and practice our new skills. By the end of that day we all had a good time and I was eager to try out what I’ve learned and meeting everyone was a blast. It wasn’t long after that when Frank opened his ETSY store featuring shave ready straight razors, minon inspired shaving brushes and what this review will be based on his Madison Shaving Soap. I can’t talk much about the packaging since I received the sample size for testing but let me say the amount was more than generous. A plastic mini tub with a screw on lid which had more than I needed to place in my lather bowl. When I opened the sample the scent jumped right out. You didn’t even have to hold it close to your nose. As one famous TV chefs would say BAM! This scent is very sweet with notes of Plum, Lemongrass, Clove, Vanilla. Ingredients: Water, Stearic Acid, Potassium Hydroxide, Shea Butter, Coconut Oil, Sunflower Oil, Fragrance. As most of you know I always bowl lather and with Madison it was a breeze. I was amazed at how much soap I could place into the bowl from the sample size tester and during that time I noticed an increase to this already strong scent. 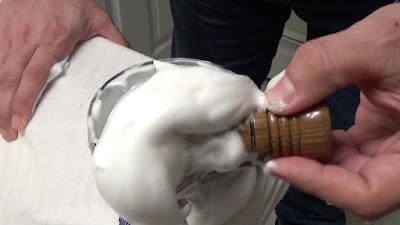 I used my Nathan Clark custom brush and the Razorock German 37 Slant for this shave and once I ran the brush under warm water I emptied it into the bowl and began to lather. Instantly I could see the suds appear and in less then a min peaks and then after another 50 seconds or so it was ready. A rich creamy lather that was ready to apply. This lather was able to hold on to my 5-day old beard with no issues and providing great coverage. My razor had a fresh blade and I sometimes nick myself on the first shave but not this day. I was able to use my slant without any issues regarding slickness and glide. My post shave feel was great and the scent was still present for an hour or so afterwards. 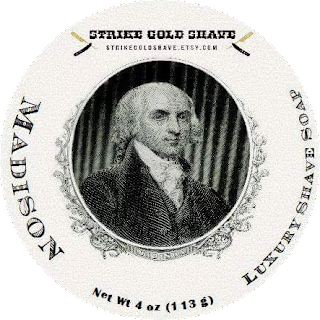 So I had a great shave with Madison if you like strong scented soaps this one for you. Just a pleasure to shave with and if you do buy a straight razor from Frank don’t forget to add this to the order as well.